Audio. Made possible on our Website with the much appreciated technical assistance of Prabhu Madhusudan, whose extensive audio archive at http://krsna.cc is the nourishment of countless fortunate souls. First uploaded 14 May 2002 as RealMedia file. Re-uploaded as mp3 file, December 2011. When I fortunately came to Srila Guru Maharaj's lotus feet in 1946, after two months Srila Guru Maharaj took me from here to Sridham Puri to the Car Festival of Sri Jagannathdev. At that time I met Sripad Bhakti Vichar Jajavar Maharaj for the first time. Sripad Jajavar Maharaj was the last sannyasi disciple of Srila Bhakti Siddhanta Saraswati Thakur. A few months before Srila Saraswati Thakur disappeared, he gave sannyas to Jajavar Maharaj. At that time Jajavar Maharaj had fear to take sannyas. Srila Prabhupad (Saraswati Thakur) asked him why does he hesitate. Jajavar Maharaj replied that sannyas is very heavy, he is very young and if he can't maintain it then it will be very difficult and therefore he has much fear. Srila Saraswati Thakur said that you are going to take shelter at Abhay-Charan, the fearless feet of Godhead, so why hesitate. Sannyas means you will deny everything, and closely take shelter of the seva of Guru-Vaishnava. Prabhupad gave him sannyas, and, right up to the end, Jajavar Maharaj maintained his sannyas nicely. I composed several slokas about several Vaishnava pranam, maybe 30 years ago or more. At that time I composed a sloka about Sripad Jajavar Maharaj's pranam in Sanskrit. (Quotes the sloka.) Guru Maharaj and Jajavar Maharaj were very happy with this sloka. I met Jajavar Maharaj several times, with the blessings of Srila Guru Maharaj. Jajavar Maharaj from time to time came to Srila Guru Maharaj, and he said I am coming not only for your darshan but when I come here I get my Guru Maharaj's sanga (association). He felt Srila Sridhar Maharaj and Srila Saraswati Thakur are non-different. After the disappearance of Srila Saraswati Thakur, many of the Godbrothers of our Guru Maharaj always wanted to come here for the loving association of our Guru Maharaj, Srila Bhakti Raksak Sridhar Dev-Goswami. Jajavar Maharaj joined Srila Saraswati Thakur's Gaudiya Mission at a very young age. He could sing the songs very nicely, He was very simple. My composed sloka says he is looking very simple and that there was no inauspicious shadow in his body, always he appeared very auspicious, and he tried his best always to serve Srila Saraswati Thakur. He was not a great pandit, but he had many pandits as his disciples. Why? Because he was a simple and great Vaishnava. I have seen, like a shadow, Sripad Jajavar Maharaj always going with our Guru Maharaj. Jajavar Maharaj gave much relief to Srila Guru Maharaj at a time of much difficulty here. Headed by him we went to many places for collection to pay off a loan for Srila Guru Maharaj. Sripad Goswami Maharaj also went for collection. Srila Guru Maharaj was very happy. Jajavar Maharaj also sometimes threatened us (chastised us) as to why we are not doing our seva properly to Srila Guru Maharaj. 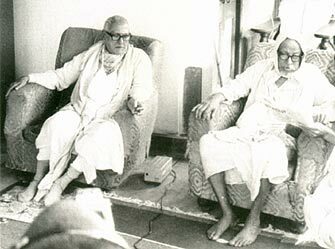 After joining the Mission, Srila Saraswati Thakur gave Jajavar Maharaj some opportunity to learn Sanskrit. He gave a unique type of Srimad-Bhagavat pat and kirttan. I heard from Jajavar Maharaj that after the disappearance of Srila Saraswati Thakur their only shelter is Srila Guru Maharaj, and Srila Guru Maharaj is the only person who can distribute the nectar of Rupanuga Sampradaya. Sripad Madhusudan Maharaj also came here the other day and said like that. Swami Maharaj, Goswami Maharaj, everybody told it: "When Srila Sridhar Maharaj is speaking we are thinking our Guru Maharaj is speaking." N.B. To download files (audio, video, QuickTime slides, or any linked file on our websites) to your computer: right-click on the link (or control-click on a Mac) then click on 'Download Link' or 'Save Link As...' or 'Save Target As...' or similar wording.